Science developments and discoveries, both large and small, continue to change the world we live in. Science is a way of life, suited to people who are open-minded and able to question why and how we do things. 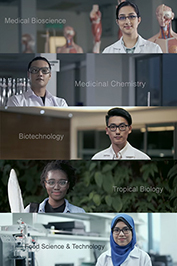 As a Monash Malaysia student, you will be inspired by great teachers, researchers and fellow students, who are shaping the future of scientific knowledge and practices. Upon graduation, you will be able to lead in a career where scientific knowledge and thinking is important. Science at Monash offers you choice. Depending on your background, you can complete a generic science degree, where you tailor your own course of study by selecting the units that suit your interest. Students also have the option of pursuing our prestigious honours program and undertaking independent research under the guidance of a world expert in their area of expertise. Contact the School of Science for more information about course accreditation, staff contacts and school events.